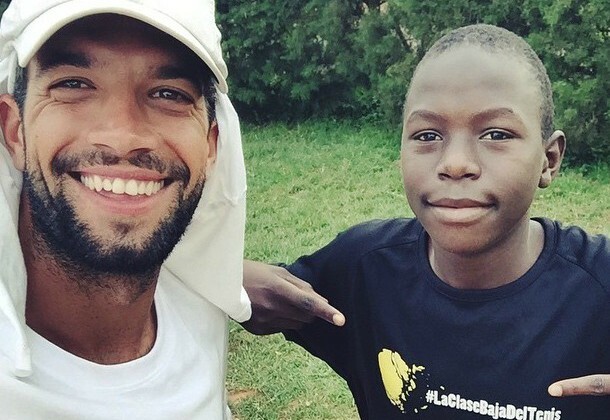 We already told you about #TennisAid, founded by Martin Rocca and Abel Rincon, that collect sports equipments and offer them to kids living in poor countries. 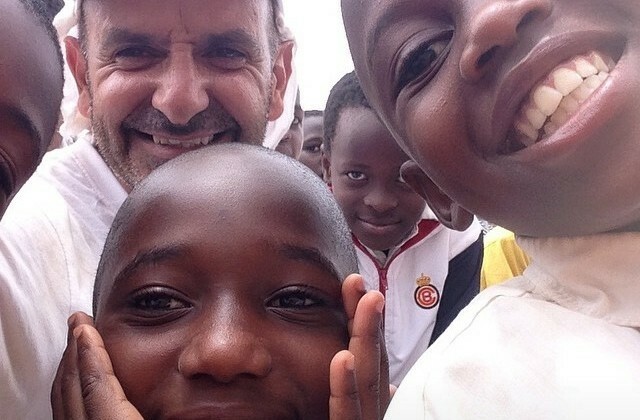 You can read more about TennisAid’s first trip in Uganda here, also check out Martin’s interview here. You can now help them fund their new charity projects, all you need to do is take part to their crowdfunding campaign. They just need €200 more to reach their €3,000 goal. So, like me, support TennisAid! yep that’s me wearing the beautiful TennisAid shirt on sale on tennisaid.org. Follow TennisAid on Instagram, Twitter and Facebook. Julius, the owner of the house we stay has a class at 6 am, that’s why he wakes up at 5. I’m listening to his movements and I can’t sleep. Abel is still asleep and I’m lying in bed thinking about all we are experiencing. At 8.30 we prepare to leave, eat a couple of slices of bread with Nutella, and we go. We stop at one of the many gas station and drink a Sprite for breakfast. Players on the football field greet us on arrival. We are not strangers, they consider visitors a good thing, something very typical of the people in Uganda. Kids are coming slowly, they’re taking their time but they mark the lines and prepare the court. We play with them, we don’t understand the rules but manage to have fun. Once again we divide the group, some go with Abel and the others stay with me. The 2 hour tennis less we have today pass really quickly. Suddenly we realize that the time has come to say goodbye. We start to bid our farewells and things get complicated for us. We take pictures and videos with the kids, both of us look for his favorite students. I give one of the boys, Edward a Boca Juniors shirt that belongs to my son. I am looking for Siyama, one of the smallest. On Monday during class, he tripped over one of the cables that support the net and hit his knee. For nearly an hour he sit on a rock outside the group with signs of pains. Every now and then I would approach him and ask if he was OK. After a long time, I tried to convince him to join the group, and he did, despite his knee pain. But the more the minutes passed, the more I noticed he was less distant with me and he began to smile at me. I took that as a small personal triumph. I swear I’ll keep that little pen as a personal treasure for the rest of my life. At 3 pm we are at the School for Deaf Children. Ivan, the teacher who helped us during the lesson, is not there, so we have to make our own sign language. To our surprise, the net is already in place. We just have to start. The class goes well, even without Ivan. […] We finish class, and the kids bring a football and invite us to play. It’s amazing how they can run at full speed in flip flops and control the ball so well. Then, we leave for home. Every time we seek to isolate ourselves, the memories come back to hit us in the face. It is impossible not to be emotional. To make matters worse, thanks to our bad habit to look at our mobile all the time, we see pictures of “our” kids, and it’s another slap in the face. We are tired and want to go out for dinner. Julius joins us and Abel begins to download videos from the Iphone and GoPro, and explains to Julius how to organize Tennis League between schools. We speak of formats, regulations… It’s getting late and we go home. Tomorrow is our last day in this beautiful city. Follow Martin on Twitter and Instagram. Up at 9. We must leave quickly to East Kololo, they share the football field with the kids of Shimoni. Once again the football field is taken when we arrive and that let’s time to visit the school facilities and meet the Director. We are about to start the class, and we are told that there will be many absences because the school sent home the kids who did not pay the quarterly fee of 20 dollars. Hard decision, nut it is not unusual. We are starting the class and suddenly we realize 40 kids are there, in fact almost all are there. They don’t understand English as well as the kids from the previous days, so our friends, the coaches of the Jouvin Child Sports Association give them our instructions. Anyway, we managed to understand each other, and 2 hours passed quickly. While doing the class, we see the kids of the Shimoni school (both schools are only 100 meters away), they start shouting our names and greet us. Strong emotions to see these kids showing us their love. Little by little, they’re coming, until they’re almost all there, with Ivan one of the school teacher who collaborates with Jouvin to communicate with the children through sign language. All are dressed in the clothes we gave them. The boys who received girls polos too, I give them boys shirts and the smiles they give me is priceless. We teach them how to volley (something they had never done before), they enjoy it very much and learn lightning fast. The 90 minutes fly so fast, but they know we’ll be back and say goodbye tenderly. Suddenly a very young child about 3 years old appears. He is the brother of Leticia, one of the girls from the school for whom I have a particular weakness. 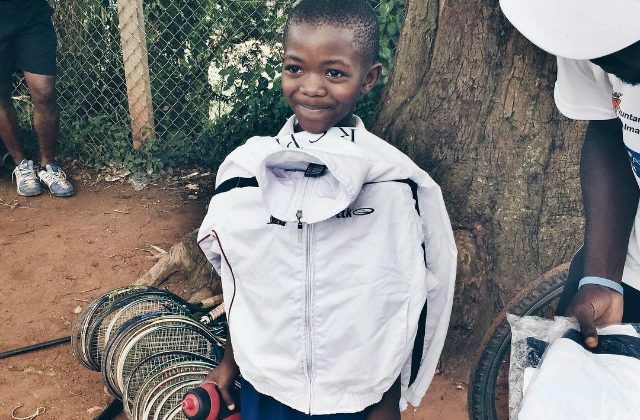 Her brother is not deaf, but he’s here with his father because Leticia has finished the school year and can go home but she stayed this week to attend our tennis lessons. I find a size 4 shirt in my backpack and give it to her little bro. I will never forget these moments in my life. We leave on a motorcycle and the adventure is unforgettable. 3 on the bike, the traffic seems to have no order (there are no traffic lights), total chaos, but we have fun at every intersection. We go to the Mandela Stadium, built about 10 years ago. A stunning place that is only used when the National Football Team (who happened to be training in an adjacent field) play. There’s a multi-sports complex and two tennis courts Danniel our friend is trying to manage. But like everywhere, the bureaucracy, ignorance of the leaders and disregard for having excellent facilities left to oblivion, this process takes time and money. It would be a real pity that the project would not be approved. On the way back we passed the campus, where the cricket team trains, and then we go to the High Performance Sports Center which has huge facilities and where many high level athletes train in various disciplines. 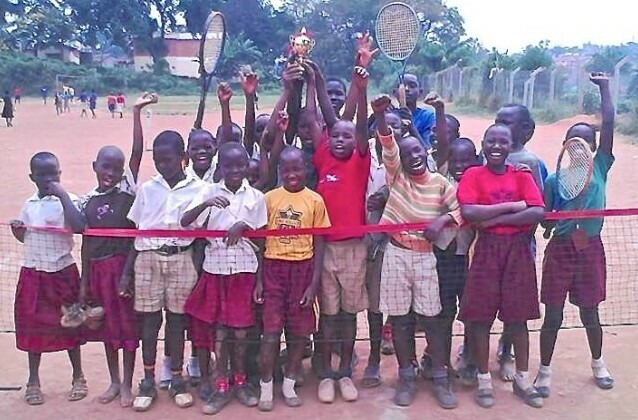 We also pass by the Lugogo Tennis Complex, one of the most prestigious clubs in Uganda, where they have played Davis Cup and ITF tournaments, with a very nice center court with covered stands, but that is really nothing more than a neighborhood club. We left at 8am to be on time at the Shimoni Primary School. Classes started at 10 but we had about 45 minutes by foot and then had to prepare the nets, the marks, since the court was a football field. The first lesson was on Sunday afternoon, but this time it was on Monday morning, so there was a lot of traffic and cars, thousand of bus and boda-boda, motorbikes carrying people for 1 dollar. All this made this walking down the street (no sidewalks) an indescribable experience. We arrived at the school and discovered that the field was occupied, a football team was training there. 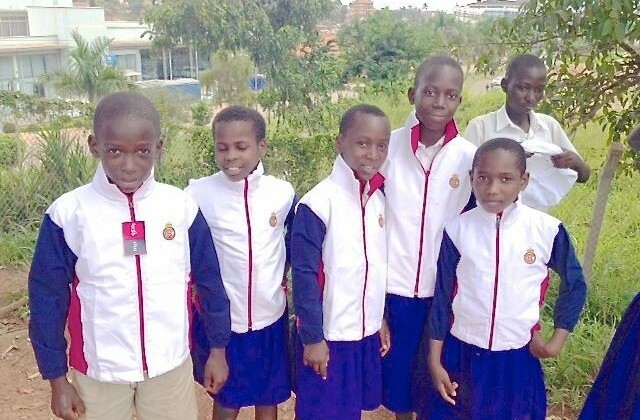 Our friends took us to tour the facility, we were introduced to the sports manager and to the school director who – like the day before at the Ntinda school – asked us to sign the visitors book, and put our names, address and a comment on our visit. We started the class and divided the group into 2 groups: 18 kids worked with Abel and 24 with me. Both groups warmed up and then worked in small groups. The ease, speed and discipline they showed in each activity kept surprising me. I keep thinking about the huge amount of times we tell our students again and again how to do certain things that should be automations, but these kids just needed ONE indication and obedience was absolute and instantaneous. The class was scheduled for a 3 hour session, but we said that was too long for the kids. Coaches told us that these kids so enjoy playing that it would be actually too short. After an hour of play, some asked for permission to eat something, while the others who had no food kept playing on their own. Less than 3 minutes after, almost all the kids were back with racquet in hand as they considered that stopping to eat was just a waste of time. For 3 hours we shared exercises, games, jokes, photos and we would have wanted to give more of our time and effort. Simple and exciting. Even now, I remember it and my eyes are filled with tears. After the farewell, we undertake our 45 minutes walk, which we do in silence. Not because we were tired but to assimilate all we had lived and felt that day, and we were really touched. We returned home really late, almost midnight. I went to bed at 1, while Abel edited videos until 4am. Having been in daily contact with our friends, we knew we came to Kampala during the raining season. It is Sunday morning and it rains heavily. At 11 it stops raining and the sun rises, the sky is almost cloudless. We open the bags and give them all the clothing and equipment we could collect. We take a Minitennis net and start playing in the courtyard with a neighbor’s child. Our hosts, coaches of the Jouvin Child Sports Association have scheduled a lesson with the Ntinda School for the Deaf. 16 deaf children expect us to give them an extraordinary tennis lesson. The first contact was really strange. You could tell they had expectations to see two coaches visit them, but to make a good first impression on foreign children who are deaf and almost mute (the few who can speak do it with much difficulty) would not be an easy task. We started doing a simple warm-up routine, and to our surprise, they did it perfectly. Then we went to do an exercise in pairs so everyone could work at the same time. Again they gave us a lesson in discipline, seriousness and obedience. They worked non-stop, no gesture of annoyance or discomfort. And always smiling. Then we started a competitive exercise and they were all smiling because the enjoyed everything we offered. We divided the group of kids in two. Some worked with Abel and others with me. The iam was to commit the fewest errors possible, and my team ended up losing. Those who were with Abel jumped for joy, but the strange thing was the celebration was silent. My group laughed because I pretended to be sad about the defeat. We played again and this time we won. Explosion of joy! And suddenly a girl came behind me and hugged me. At that moment, I felt millions of feelings. And for a minute I needed to move away from the group and have a moment for myself. Being deaf-mute in Africa is not an easy obstacle to overcome. Yet, they seem happy with what they have, and they develop normally. That hug made me think that these children have a huge lack of affection, but in fact it showed the great heart they have. It was really moving. Next article: our second day in Uganda, at the Shimoni school.